In a large skillet heat 1 Tbl olive oil and over med heat add the sweet onions and saute until translucent and soft, add the poblanos and continue to saute and reduce heat in order to not brown the onions. Add the garlic and salt and cook an additional 5 mins. 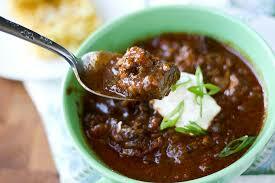 In a dutch oven or large pot with a lid add 1 Tbl olive oil and brown the beef cubes on all sides until crusty. Remove the beef to a plate. Return everything to the dutch oven and add the rest of the spices, cook and stir until they form a thick paste on the meat. Watch carefully and do not scorch the spices. Add beer to deglaze the pan, and simmer until reduced and meat mixture is thick. Add beef broth and reduce heat to low, simmer for 3 hours, stirring occasionally. When done remove about 2 cups of the beef and shred with a fork, return to dutch oven and stir, this will help to thicken chili. Serve with a dollop of sour cream and some of the chopped tomato, onion and cilantro.